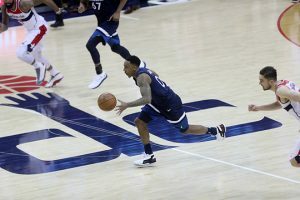 The Wizards have had a tough challenge finding players that can step up every night since the absence of John Wall, tonight it was just plain finding players that had answers for the Minnesota Timberwolves, who trailed by 10 points more once in the fourth quarter, but still emerged victorious in the final seconds of the game tonight. Minnesota who didn’t even have All Star Jimmy Butler in their line-up tonight and were able to deliver an all star performance from their entire team without him. Karl Anthony Towns led the Wolves with 38 points and 10 rebounds. Nemanja Bjelica helped his team with 17 points and eight rebounds and seven assists. Andrew Wiggins also had his way with the Wizards and finished with 16 points and two blocks, but it was that guy Jeff Teague that the Wizards have seen enough of over the years, who finished them for the night with 13 points, five assists and two steals. Markieff Morris led Washington with 27 points. Bradley Beal added 19 points and five assists. Tomas Satoransky had a solid all-around game, finishing with 15 points, eight rebounds, seven assists and three steals. Ian Mahinmi rounded things out with 10 points and nine rebounds. “We have to play better in the final minutes of games. We had one more shot as we got a break with the inbound pass, but Teague got us again,” said Scott Brooks after the game. “We had the same start we had in the second quarter, defensive mistakes. And we’re continually making them. We got to clean it up otherwise—I think we’re up six going into the second quarter and they jumped on us. Then the same thing happened in the fourth quarter. They went on a run. We got to get stops, and we got to stop worrying about scoring,” said Brooks.